Stichting Not For Sale Nederland is part of the international Not For Sale organization, which uses social enterprises to fight human trafficking. The Dutch foundation has been active since 2012 and operates independently from the international organization. Its mission is to offer victims of human trafficking the skills and confidence required to build a new and independent life to prevent them from falling back into the hands of traffickers. This is done by offering education and training at the social enterprises of Dignita. At the Dignita restaurants, former trafficking victims receive training and gain work experience. One-hundred percent of the profits earned by Dignita are dedicated to the training program of Not For Sale. The aim is to offer trainees an anonymous and safe environment, giving them the possibility to experience what it is like to function in a commercial business. 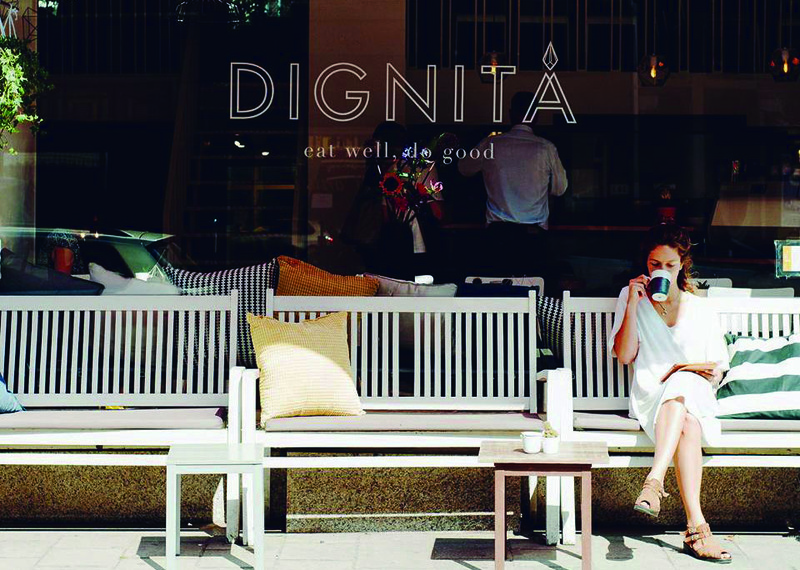 But Dignita is not solely positioned in the market as a restaurant offering training and apprenticeships to victims of human trafficking. Customers should primarily return to the restaurant because of the great food and high service standards. Not For Sale currently provides three vocational trainings in hospitality. The funds raised by the AWC with the Benefit for Dignity will be used to sponsor women in these existing programs or in other accredited programs. This will allow Not For Sale to train more women and even train women in fields other than hospitality or retail. In 2020, Not For Sale hopes to open a social enterprise in The Hague. The Director of Not For Salewas featured in CNN’s Freedom Project. Learn more here. Open 7 days a week: 8:30 a.m. – 5:00 p.m.
Open 7 days a week: 9:00 a.m. – 7:00 p.m. Kitchen is open until 5:00 p.m.